May lightning strike you if you don’t tell the truth! That old phrase/threat went through my mind when I watched a video of lighting strikes in South Charlotte recently. Oddly, I also recall when the Pope resigned Feb. 2013, and lightning struck the Vatican on the same day! It doesn’t matter where you stand, what you wear or carry, the best thing to do is to avoid the locations where lightning can strike. For example, anywhere outdoors or in unprotected structures. Let’s say you’re somewhere outside where there are no buildings to hide in. A car (with a hard top of course) will protect you. A direct strike to your car will flow through the frame of the vehicle and usually jump over or through the tires to reach ground. Note I said usually. If you happen to be unlucky enough to touch the metal frame with your arm (or other body part) it could ruin your day. Especially if you don’t get out of the vehicle and check it out. Fuel can be ignited by a strike and cause a fire or explosion. Did you know it’s relatively rare for people to die from a lightning strike? Mary Ann Cooper, a professor of medicine at the University of Chicago, estimates that nine out of 10 people survive! As a matter of fact there are so many survivors they’ve formed an organization: The Lightning Strike and Electric Shock Survivors. It’s even international. If you want to read some startling stories, look that group up. Many of them have been zapped more than once. Make no mistake however, the small percent who do die adds up. According to the National Oceanic and Atmospheric Administration (NOAA), an estimated 24,000 people are killed worldwide each year. Over the last 21 years, the United States averaged 51 lightning strike fatalities, according to NOAA, placing them second behind floods for weather killings. That should be eye-opening news for us all. Don’t underestimate them. Mankind has always been fascinated with lightning, generally attributing it to angry gods. The Greeks had Zeus whose habit of throwing lightning bolts at people made him feared among his believers. 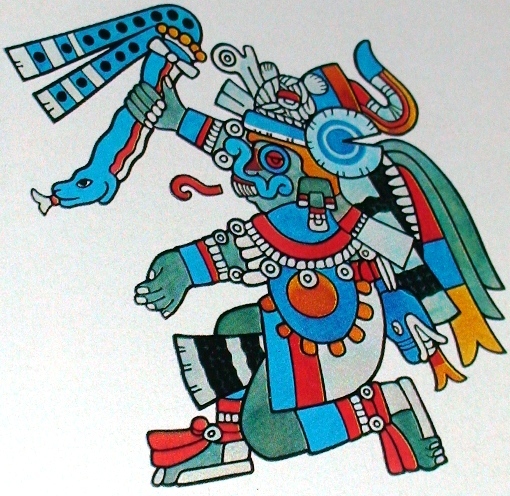 The Aztecs had a god, Tlaloc, who, depending on his mood, could bring beneficial rain or killer lightning bolts, flood, and disease. In Slavic mythology, the highest god of the pantheon was Perun, the god of thunder and lightning. There are more, but lack of space doesn’t permit their inclusion. I’ve got a couple of medical terms dealing with lightning I bet you never heard of: Keraunomedicine (study of lightning casualties and associated treatments), and Keraunopathy (the study of effects of lightning on the human body). Illuminating as all of this information may be, being struck by lightning is not something most people worry about. That is unless you’re a statistic and this information comes too late for you! things to be more concerned about, I’m sure. Like where your next meal is coming from or if you can find a babysitter so you and your spouse can go out for a romantic dinner. Forgive me for being so flippant about a subject that strikes terror into some people. Sometimes I can’t help myself. I’ve never been struck by lightning (knock on wood!) nor have I ever met anyone who was. Like most of you, I’ve heard and read a lot of lightning strike stories, however. One of my favorites is Frankenstein. Who can forget that tense moment when Dr. Frankenstein opened up the ceiling of his lab to allow a bolt of lightning to bring his monster to life? Why Is it So Much Fun to Be Afraid?